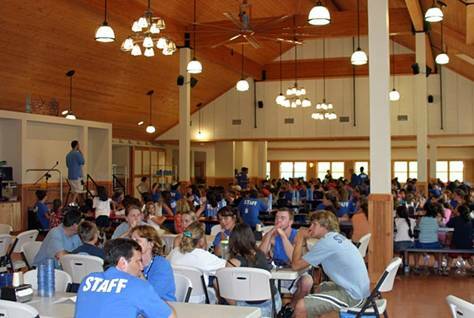 Dining is a key element to a successful retreat experience. The sharing of meals with friends, family and colleagues is enhanced by our spectacular service and highest quality of food served in a magnificent setting. Our Dining Hall is complete with a fireplace and an outdoor deck overlooking our lake. 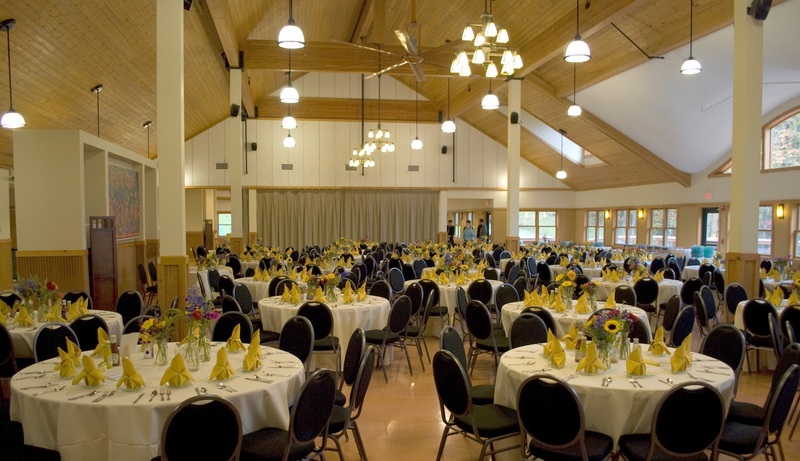 This beautiful, state-of-the-art air conditioned and heated facility can accommodate up to 700 guests. For smaller gatherings, our flexible space can provide more intimate dining areas. Our culinary team provides exceptional food in presentation and taste. We partner with you in customizing a menu that will delight your guests. Our goal is to ensure that you enjoy delicious, nutritious and beautifully presented meals. We have always maintained the highest level of kashrut observance in order for all Jewish groups to feel comfortable holding retreats at our facility. We remain committed to orthodox supervision for that reason and are supervised by the Rabbinic Council of Greater Washington. What does this mean? Any Jewish group will feel comfortable holding their retreats with us, especially since we offer Cholev Yisrael products to anyone interested. The benefit? We are able to purchase/offer a wider variety of dairy products, such as ice cream, yogurt, etc. The (kosher) icing on the cake? We partner with Star-K supervision, since they work in concert with the Rabbinic Council – we have the same mashgiach (supervisor), as well as the same regional coordinator. Long story short? Our food is kosher, we’re supervised by an orthodox entity, and we are able to offer a wide variety of food products. Our facility is nut-prohibited due to youth allergies and we strive to accommodate almost every dietary need possible. Our dining hall is complete with a fireplace and an outdoor deck overlooking our lake. This beautiful, state-of-the-art air conditioned and heated facility can accommodate up to 700 guests. For smaller gatherings, our flexible space can provide more intimate dining areas. Bon appetite – we know your taste buds will tingle! Our responsive food service staff will provide you with customized menu options that meet your needs. Groups are not permitted to bring meals or snacks on-site. Our kitchens are off-limits to guests. Our goal is to ensure that you enjoy terrific, nutritious, and beautifully presented meals. After all, it’s more than just food – It’s an event. Daily refreshments include water, flavored water, coffee, tea, whole fruit, pretzels, chips, etc. Evening snack includes choice of either hummus/pita, vegetable/dip or fruit trays. Campfire with s’mores can replace evening snack if desired. All groups are welcome to self-serve their own pre-approved Kosher and Mevushal wine, liquor and beer. Our staff will instruct you the proper areas to store, serve and dispose of your spirits. All alcohol will be inspected before entry into the kosher Dining Hall Building, which is under strict Star-K Kosher supervision. Please communicate your alcohol intentions with your Guest Services Rep during pre-event planning consultations. Additional mevushal wines may be available. Please check labels to confirm.